So, why am I holding a bunny? 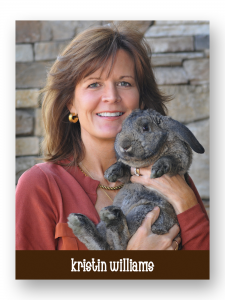 This is my headshot for Young-Williams Animal Center where I’m honored to have served as board chair. It’s actually the only recent photo I have as I’m usually the one taking the photos. Thanks to Jack Williams, friend and photographer, for the shot. That bunny was a real trooper. I shamelessly leveraged his furry charisma to my advantage. Since 1991, KRISTIN DESIGNS has been acquiring projects primarily through referrals ~ building trust and creating long-term relationships along the way. I’m a client-centered studio committed to providing personal attention and professional results. If you’re a start-up in need of a comprehensive corporate identity or an established business requiring a marketing “tune-up” I’d like to talk to you about opportunities for your business. Creating new marketing materials can be a challenging task. I take responsibility for your entire project: concept, copy writing, photography, design and printing. I am a turn-key website development studio as well, providing design, hosting and maintenance of your site. I keep the process relaxed and enjoyable, yet understand the hard-earned value associated with your business name and take the task of enhancing it very seriously. If you’re thinking of entrusting your good name to a design studio, I hope you’ll recognize businesses on this website and inquire about my studio’s creativity, responsiveness and desire to ensure you succeed. I’m very involved with Young-Williams Animal Center, serving as a past Chair of the Board of Directors. I enjoy tennis, snow skiing, movies, reading, hiking the Smokies, and spending time with my family, Mark, Anna Bryn (12 yrs. old) and Crumpet, our Golden Retriever. We all love Knoxville and we each strive to give a little something back to the community. Yes, even Crumpet. INQUIRING MINDS Want to Know Even More! My studio places me at the intersection of two disciplines I really love: business and art. Combining distinctive images and creative copy in fresh ways to convey a message is challenging and fun. I’ve been somewhat obsessed with advertising since I was a kid so I feel very lucky to have a job that I truly love. I have a bachelor’s degree in business and a master’s degree in advertising, a combination that gives me a solid understanding and appreciation for maximizing value for my client, employing proven advertising methods and keeping “the bottom line” in mind. Because as the saying goes, the bottom line is… the bottom line! I got my start over 20 years ago as an intern while in graduate school at UT. My internship ended but I continued to work for the good people at Grady’s Goodtimes Restaurants. Those dynamic individuals created many new businesses and were kind enough to take a chance on me for their marketing, including: The Chop House, Connors, NASCAR Cafe, Chops Grill and others. From these projects, more and more opportunities presented themselves as friends and business acquaintances of this core client group requested my marketing assistance. Often, I became attached to a project at the very conception of the business. This gave me the chance to not only create the identity (logo), but to design collateral materials for the new business as well. I was too naive to know that I didn’t know what I was doing and I “signed up” for every project I was offered. So, after writing TV ads, radio spots, shooting and styling food, writing marketing plans, designing billboards, vehicle wraps, packaging, t-shirts, and things I can’t even remember — I’ve come to realize that I definitely have a strong suit and need to stick with it. My wheelhouse is print design and web design. Keep in mind, great design only has value if it leverages the marketing strategy of the business. A beautiful brochure isn’t selling your business if it doesn’t communicate with the target market effectively. I make sure I understand your marketing strategy, or if needed, help clarify your strategy before designing anything. I really enjoy working with people and immersing myself in different industries as I try to learn everything I can about each client. So interesting! I also find that this direct connection helps me understand more fully your corporate culture, expectations and aesthetic style. All of these qualities need to be reflected in your marketing materials. Your designed materials should be tailored to fit your business exclusively and meet its unique marketing goals. After all, good ads solve unique problems. What issue do you need to address? Increased awareness of your company? Brand-recognition? Educating the consumer? Clarifying a product benefit? There are countless reasons to advertise. But, I really believe all good ads have a common element: solving a problem.